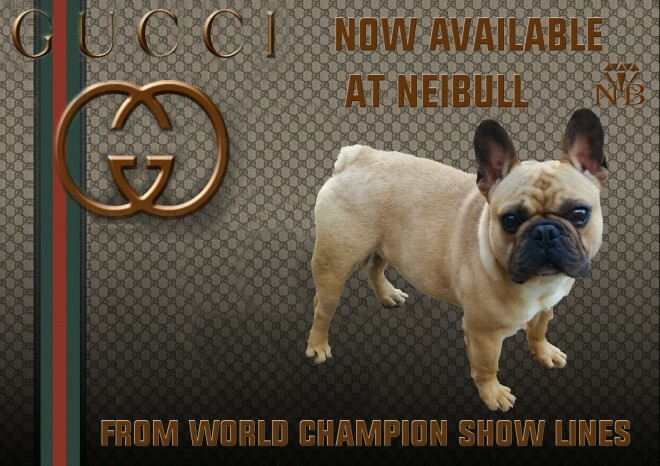 NEW TO NEIBULL IS GUCCI A FABULOUS ALL FAWN STUD DOG. HE IS SHOW QUALITY AND VERY TRUE TO TYPE WHICH HOW A FRENCH BULLDOG SHOULD LOOK . HE WAS BRED BY A WELL KNOWN KENNELS CALLED GOLD.SIERRA www.goldsierra.hu AND WAS BRED FOR QUAILTY AND NOT COLOUR. IF YOU ARE LOOKING FOR A VERY GOOD QUALITY STANDARD FAWN SHOW TYPE DOG HE IS KNOW AVAILABLE FOR STUD YOU WONT BE DISSAPOINTED WITH THIS FABULOUS BOY ALL STUD FEES ON WEBSITE www.neibullshowdogs.co.uk Here at Neibull Showdogs we deliver every service required under one roof to ensure from day one your experience in breeding goes as smooth as possible with any of our stud dogs. As we have our own Fertility Clinic that specialises in qualified Scanning. Micro.Chipping and Freezing. We now offer in house Progestrone Fertility testing so we can ensure that we not only mate on the correct days but done in a clean and professional manner which is delivered by experienced Dog handlers. Our property has full CCTV recording so you can be assured that your pet is in the best hands at all times as we offer boarding facilities. Our aim is to offer our knowledge gained within Dog Breeding to give anyone using our service the opportunity to produce your own litters and achieve your goals. We also offer our own designed tried and tester incubators and on hand information and experience over the phone help 24.7 to allow you to start in the right direction we have created our own whelping information booklets that we give out and we also offer whelping packs and a multitude of products designed and tested by ourselves to support you every step of the way for when your puppies arrive up until the day they leave you. Please see all our products we have to offer on our website.